Conad del Tirreno has developed efficient and advanced logistics, effectively responding to the needs of the partners and customer satisfaction with regard to the convenience and freshness of the products. Currently, the distribution centers in Tuscany are 6: 3 in Tuscany, 2 in Lazio and 1 in Sardinia, for more than 140 thousand square meters.Specifically, Conad del Tirreno makes use of baricentric territorial distribution branches to the reference network. Territorial branches: Monastir (about 30,000 sqm), Civitavecchia (over 20,000 sqm). The territorial headquarters exclusively manage the flows of goods in their reference areas (Sardinia / Lazio). This network allows Conad del Tirreno to have a dynamic logistics in terms of efficiency of supply, with integrated management of the entire supply chain. Conad del Tirreno had the need to oversee the process of loading and unloading goods at affiliated stores through the use of a smartphone. 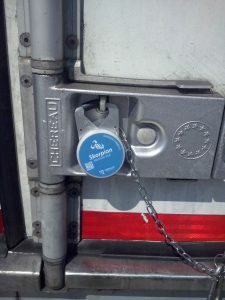 In particular, the request was to be able to automatically check, with an electronic seal, the opening and closing of the trailer doors, which up to now was carried out at any access by the operator via a “throwaway” seal.Another objective was to constantly monitor the internal temperature of the trailers with a wireless system. Since 2014, Conad del Tirreno uses the solution identified by TERTIUM Technology: the electronic seal to install in the trailer, which mounts an active 2.4GHz RFID with a door opening sensor and temperature data-logger. 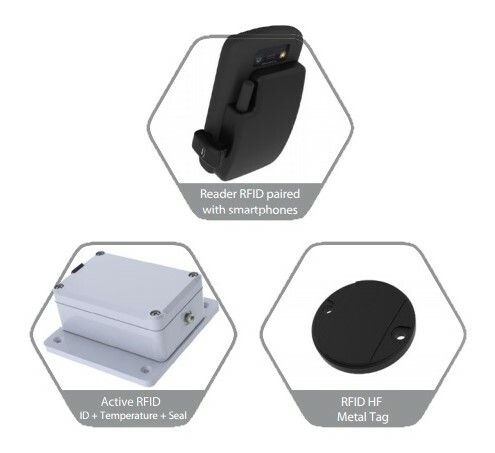 At completion of the system, an RFID reader was physically coupled to the smartphone’s shell, capable of reading TAG RFID at 2.4 GHz and TAG RFID HF. Thanks to these two devices and the coupling with a smartphone with GPS, it was possible to realize the door and temperature control automatically and geo-referenced. The development of this technology, the low-cost reliability and the low accessibility of these new electronic devices allow to guarantee real-time shipments, thus removing the plastic seals previously attached to the trucks. Through the new technology, every single movement of high-value transport units is traced, such as the isothermal containers used to deliver fresh fish, monitoring the temperatures during transport and delivery, and improving the application of “empty tracking” in exchange of technical travel material. 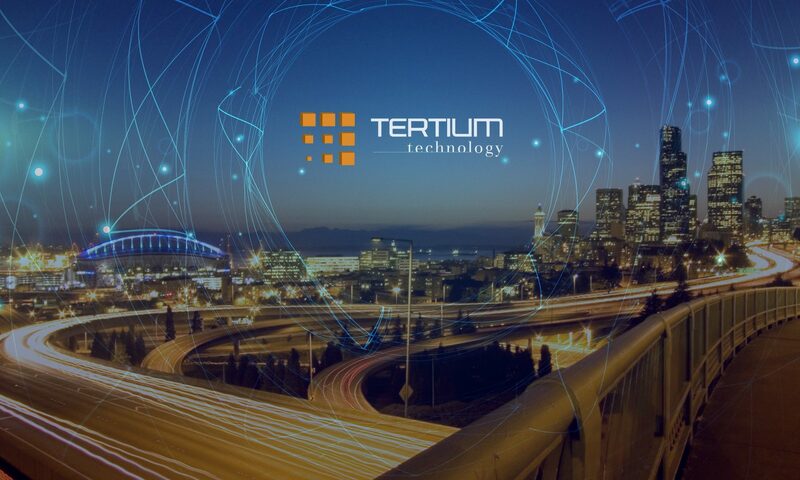 The system detects any irregularity found among the pre-defined delivery plan and any sealing and closing operations of the truck carried out by the driver without the participation of the store’s or warehouse vendor. This allows to control the position of the truck in real time and automatically send a message to the point of sale during the trip so that the store can be informed of the arrival time in advance. In addition, at the warehouse is possible to trace any inbound and outbound movement of “tagged” securities in a completely automatic manner, through the making of gates, or bends equipped with antennas for the receipt of RFID tags (identifying electronic labels Radiofrequency). Trace every entry and exit movement from the warehouses, in a completely automatic way. Currently Conad del Tirreno is the beta tester regarding our disruptive solution: the electronic seal. It acts as a GPS tracker and as a gateway if there are sensors close to it. Previous PostPrevious Which were the industries that invested most in IoT in 2017?